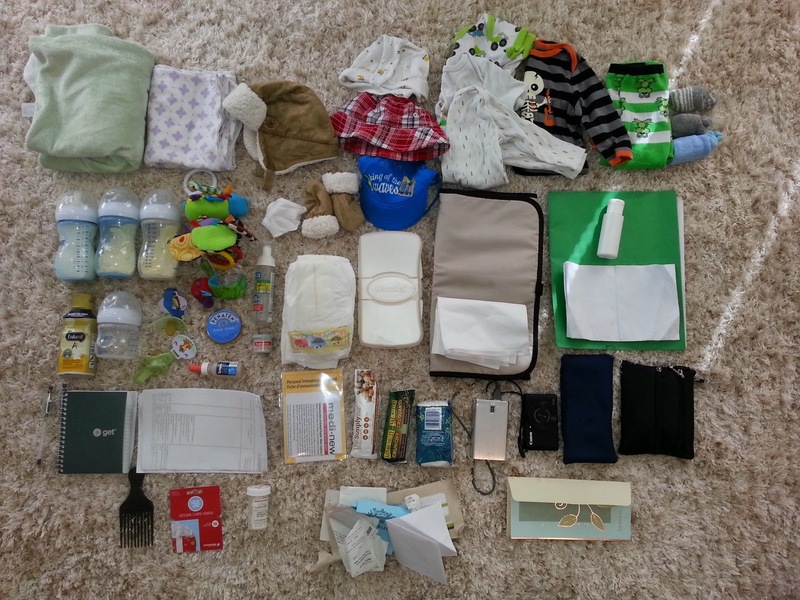 Most Important Thing in Your Diaper Bag: My wallet. If I forget anything I can at least buy more of it if I am away from home. Basic Save: Wipes. Buy a reusable container and refill it with wipes you can buy in bulk. Good Diapers! - nothing worse than a diaper that doesn't properly fit your baby's shape and size. Best Preparedness Advice: S#$! happens, prepare for it! Contents (left to right): Thick fluffy blanket, receiving blanket, winter hat and mitts, summer hats, onesies, pajamas, pants, socks, bottles and formula, vibrating toy, wrist rattle, soothers, Penaten bum cream, Sudocream bum cream, infant Tempera, hand sanitizer, 8 diapers, wipes, change pad, plastic resealable bag, infant massage booklet, massage oil, mommy plan, notebook, pens, CBT worksheets, immunization records, 2 granola bars, Kleenex tissues, battery pack, camera, cheque book, wallet, hair pick, gift card, medication, random garbage, sympathy card.